Our summers are never complete without a trip to the nearest pick your own farms. 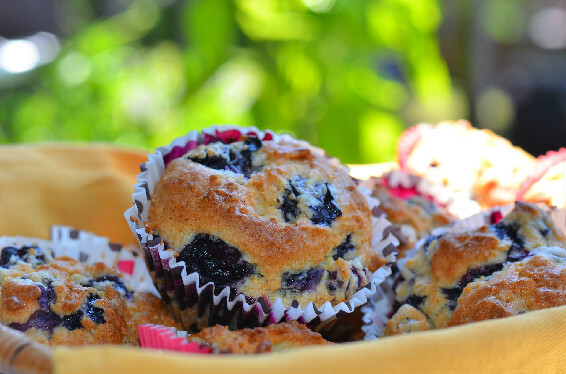 I picked some fresh blueberries over last weekend and set to make these low fat blueberry muffins using yoghurt. I was a little skeptical while adding yoghurt but was delighted to see them turn out delicious. Lightly sweet and soft these muffins would make a nice accompaniment with your morning coffee or as a dessert. If you are looking for a homemade treat that your kids would love then you gotta try this. Don’t believe me? Try these and you’ll agree with me for sure. Here goes the recipe……..
Line a muffin pan with muffin liners. If baking without liners, brush the pan with melted butter or use cooking spray. Take about 2 tbsps of flour from above, toss the blueberries and set aside. Why toss? This would help the berries not to sink down while baking. In a bowl, Sift all purpose flour, baking soda, baking powder,salt and set aside. In another bowl, add sugar, vegetable oil, egg, yoghurt and whisk until combined. Add the yoghurt mixture to the sifted flour mixture and mix until combined. Do not overmix. Its ok even if there are a few lumps. Add the bluerberries and fold in gently. Do not overmix else the berries would turn mushy. Fill in the muffin cups/pan with the above mixture until 3/4th full. Bake for about 20 – 25 mts or until a tooth pick inserted inside the center comes out clean and the top is golden brown in color. Oven temperatures differ. Keep an eye by checking at about 20 mts and continue baking if required accordingly. Cool 10 minutes in the pan on a rack, then remove the muffins from the pan and let it cool completely. Serve with hot coffee or with a dollop of butter on top.